Just the thought of Cabo San Lucas, Mexico, is enough to warm you to the core. Warm, turquoise waters, palm trees swaying in the salty breeze, hot peppers, and cold, tropical beverages are exactly what you need on your next vacation. Add to that a Cabo fishing trip and you will have the perfect holiday to relax, revitalize, and restore your winter weary body and soul. The cold Pacific currents merge with the tropical waters of the Sea of Cortez to create one of the most abundant deep sea fishing grounds available. Your Cabo fishing trip with the Cabo Fishing Fleet will be everything you ever dreamed of, with a flotilla of high performance boats, tournament quality gear, and the friendliest, most knowledgeable guides available in San Lucas for Cabo fishing. You can fish for grouper, mahi-mahi, jack crevalle, shark, tuna, bonito, sail fish, and, the ever popular striped marlin while enjoying your Cabo fishing trip, whether you prefer deep sea fishing, saltwater fly fishing or light tackle fishing. The Cabo Fishing Fleet is sure to make your Cabo fishing trip a success. Even if you have never fished a day in your life, you can experience the thrill and excitement of casting your lure, feeling a hit, and waging an epic battle of will and strength against some of nature's greatest fish on your Cabo fishing trip. Fishing licenses are required for anglers age 13 and over, and you'll want to be sure to invest in some heavy-duty fishing line. Most Cabo fishing guides advise using 50-80# line. You certainly wouldn't want to have a story about the one that got away to be one of your souvenirs! The Baja Peninsula offers the best kind of weather for all types of Cabo fishing: warm, sunny, and mild. 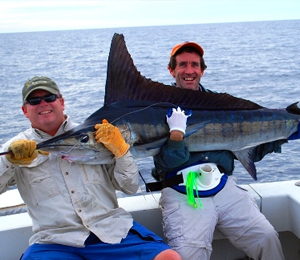 The variety of Cabo fishing trips can provide for every skill level and every budget. You can go all out on a 70-foot luxury boat or, if you prefer, you can get to the best spots quickly and easily on one of many 24-foot sport boats, or anything in between. Cabo fishing trips nearly always include food, beverages, storage space, great gear, and, most important of all, tournament winning guides who offer generations of experience in offshore Cabo fishing. They know all the good spots, some of them beautifully secluded and rich with sea life, and other, more popular Cabo fishing spots, that still retain the abundant sea life and offer opportunities to socialize with locals and other vacationers. Unlike the heavier equipment of deep sea Cabo fishing, your light tackle Cabo fishing experience offers the best of both worlds, easy to use equipment and plenty of prize-winning fish to be caught and released or captured and mounted on your living room wall. Your guides will ensure that your equipment is ready and that your Cabo fishing locations will be ideal. As you cast your lure, the warmth of the white sand beaches, the beauty of clear, blue skies and the sound of waves crashing on the beach will make you feel as though this must be Paradise. Fly fishing is an art form. It has its own rhythm and style, made even better by the stunning surroundings of Cabo San Lucas. You can charter your very own Cabo fly fishing experience with the Cabo Fishing Fleet, whose guides offer their valuable experience and knowledge to novices and veterans alike as they take you to all the best Cabo fishing spots. Their open deck boats make every likely location easy to get to and even easier to fish. Your Cabo fishing trip can net you rooster fish, jack crevalle, cerro mackerel, or cubera snapper, not to mention a great tan and a renewed outlook on life. The stories and experience will stay with you for years as you recall the excellent service, stunning views, and the excitement of your Cabo fishing trip. You will lack for nothing on your Cabo fishing trip with the Cabo Fishing Fleet. Their award winning guides have been featured on the Sportsman Channel, OLN, and ESPN and in Sport Fishing Magazine. They always provide you with the best care possible as they take you to secluded locations on their high performance boats. The gear is always in excellent condition and the views are always amazing. After you have enjoyed your Cabo fishing trip, you may just decide to try scuba diving in Key West, followed by a quick day trip to the Dry Tortugas National Park. For something extra special, the family will never forget a Bahamas dolphin encounter. This is what vacations are all about and you are guaranteed to have the time of your life!